In 1 Samuel, we met a guy named David. Against all odds, he slays a giant and helps lead the Israelites to victory over the Philistines. Well, in 2 Samuel, David moves up in the world. Eventually he gets to the top of the ladder and becomes king of Israel. He's a good king. David isn't without his faults, but as far as Israelite kings go, he was thought of as the greatest. The nation prospered under him, he sought after God and, compared to other kings, the power didn't really go to his head that much. His family line. David has a pretty strong lineage and that is what this week's design focuses on. One person in particular... Jesus. David and Jesus are a story of similarities and differences. One of the most interesting similarities is that they share the label of "king." You could consider David THE King of the Old Testament while Jesus is THE king of the New Testament. But what the word "king" means when applied to them couldn't be more different. David was a king in the worldly sense. He wore an expensive and extravagant crown that demanded respect. His kingdom advanced through a series of conquests against other people and nations (his first being Goliath). He had military might – power through brute force. He ordered someone to do something, and they did it. If someone disobeyed him, it was well within his right to have them killed. Jesus, on the other hand, was a completely different kind of king. (Spoiler Alert - We're jumping ahead to the New Testament for a little bit here!) 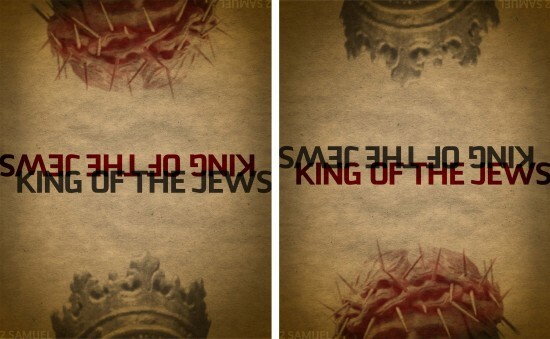 Jesus wore a crown of thorns that invited mockery. His kingdom advances through serving others and self-sacrifice. His army was a ragtag band of 12 misfits, and they had very little military might. (The few times they actually tried to flex their military muscles, Jesus told them to knock it off.) Rather, his power was through love. People disobeyed Jesus and he allowed himself to be killed all the while forgiving the people who killed him. Two different kings. Two completely different kinds of kingdoms. I know I choose between those two types of powers many times every single day. I want the Jesus type of power to be the one that seems normal and right side up to me, but many times the David type of power just seems so normal and natural (a result of what happened in Genesis).